For most people on a traditional low-fat “diet”, a Thai green curry is definitely ‘out’ – considered to have “way too much fat” in the coconut milk, not to mention in the deep fried poultry (or in this case, tofu)! But for those eating Low Carb High Fat, the fragrant aroma of the galanga root and kaffir lime peel in the Green Curry Paste beckon. 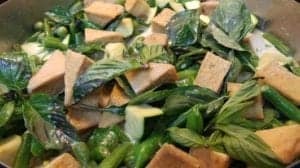 Thai Green Curry is a meal of contrasts, with the crunchy bitterness of miniature Thai eggplants, the gentle bite of zucchini cubes or golf-ball size green Thai makhuea eggplants, short pieces of long beans or Western green beans and an abundance of tender anise-like leaves of Haropha basil. What’s not to love about the natural creamy sweetness of pure coconut milk offset beautifully by the salty pungency of Thai Nam Pla (fish sauce)? Whether one adds pieces of deep fried tofu or an abundance of cut up boneless chicken or duck, Thai Green Curry can be a meal in itself. If it is felt that Thai food must be served over rice, then why not make white cauliflower ‘rice’? It’s so easy and only 5 carbs per 1/2 cup (125 ml). All there is to making Cauliflower “Rice” is to microwave finely chopped raw cauliflower with a tablespoon of water for 3 minutes covered at power level 10 (100%). Then, let it stand covered for another 3 minutes, and voila! When it is made from fresh compact heads of cauliflower, it has virtually no taste of its own and no smell! Cooked as above, it is surprisingly hard to distinguish from the carb-laden original. Thai Green Curry can be made using any fresh vegetables you have on hand, or you can be a purist and shop at a South Asian market for a variety or traditional ones. I usually use one or two varieties of Thai eggplant, long beans and when available, fresh miniature ears of corn (a mere 2.5 grams of carbs in an ounce (30 gm)). 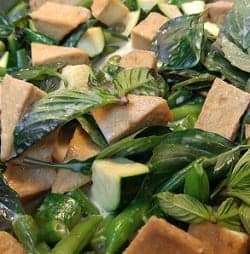 1 package of deep fried tofu* (or 1 lb of chicken or duck thighs, marinated in a mixture of Thai green curry paste (1 Tbsp), 1 Tbsp Thai fish sauce, 2 Tbsp Thai coconut milk (100% pure). *some people avoid tofu due to its naturally containing phytoestrogens and goitrogens. Then again, there are LCHF paleo-adherents that avoid most vegetables due to the compounds they naturally contain, such as phytates, oxylates and trypsin inhibitors which can bind minerals such as calcium and iron. I think the nutrient benefits of non-starchy vegetables, their fiber content as well as their anti-oxidant properties are well learning what foods they shouldn’t be paired with, to avoid an anti-nutrient effect. Heat a heavy cast iron saucepan, frypan or wok. Add the coconut oil and heat. Spoon in a heaping tablespoon of Thai Green Curry Paste (less, if you don’t want it spicy!) and splash in 1 teaspoon of fish sauce (or to taste). If using poultry, add it at this point and stir fry it until 80% cooked. Then add the vegetables beginning with the most dense, first. (I start with the miniature eggplants and then the long beans or green beans, along with the larger Thai eggplants). Toss them around in the fragrant seasoned oil until the vegetables begin to cook. Then add about 1/2 of the coconut milk and turn the heat down to medium and cover. When the veggies are ~ 80% cooked, add in the more tender vegetables such as zucchini cubes and if serving with Cauliflower “Rice”, add the rest of the coconut milk. If serving alone, I don’t add more coconut milk, because there’s nothing to absorb it when serving. Cover, and let the zucchini cook slightly. It’s important not to overcook the curry. The vegetables should be “just” cooked and still slightly crunchy. If cooking Cauliflower “Rice”, have it ready to go and cook it right at this point. Cooking it too far in advance will result in it having a strong cabbage-like smell. Toss the basil leaves into the curry and serve immediately. 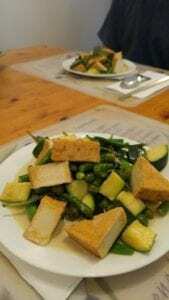 Nutritional Info: The only carbs in this dish are 5 gms of carbs for every 1/2 cup serving of vegetables and 6 gms of (net) carbs for 3 oz (100 gm) of tofu. If using poultry, then there aren’t any carbs. A half cup of 100% pure coconut milk has only 2 gm of carbs.